So what’s new? 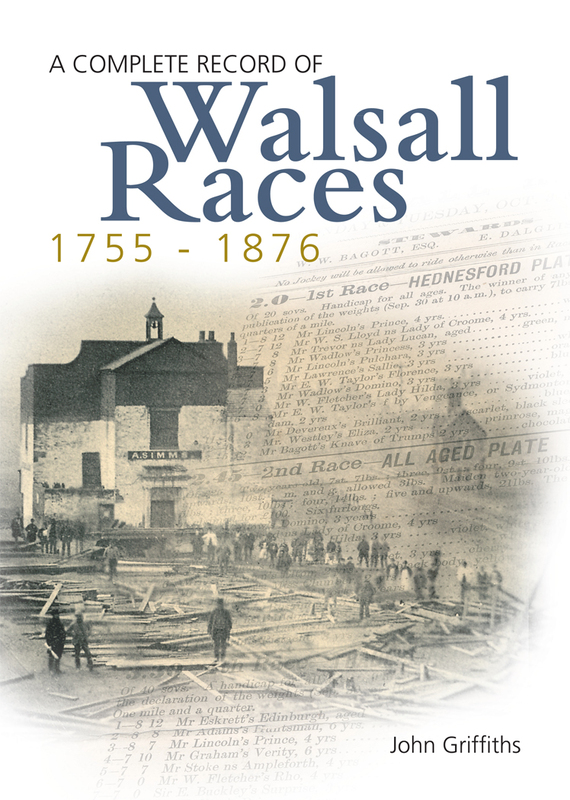 The title has changed to A Complete Record of Walsall Races 1755-1876 (ISBN 978-0-9551382-6-3). The reason for this is that in 2008, in conjunction with a well-known author from Hednesford Tony Hunt, we published another titled Hednesford’s Horse Racing History (ISBN 978-0-9551382-2-5). In consequence of this publication there seemed little point in maintaining the chapter about Hednesford in any revised editions of the Walsall book. The actual information concerning the years the course was open has change little, some new illustrations of racing personalities with small additions to the text. More information has been added to the two chapters about the jockeys and trainers. The new edition has grown by ten pages and this is due mainly to the addition of a further eight race meetings held during WWII to support the Mayor’s War Effort Fund. 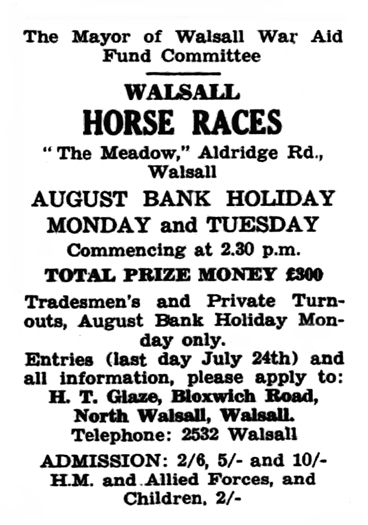 In the original book just the one meeting was covered in 1942 but in researching another project I came across a further eight meetings which concluded in 1946 with the Walsall Victory Races. There are now four pictures in the wartime chapter and they are better quality than in the first book as I had access to the original newspapers the pictures were taken from. Sadly, in the interim years since it was first published no new photographs have come to light regarding the course and so the only known picture concerning the course is the one shown on the front cover of both editions. 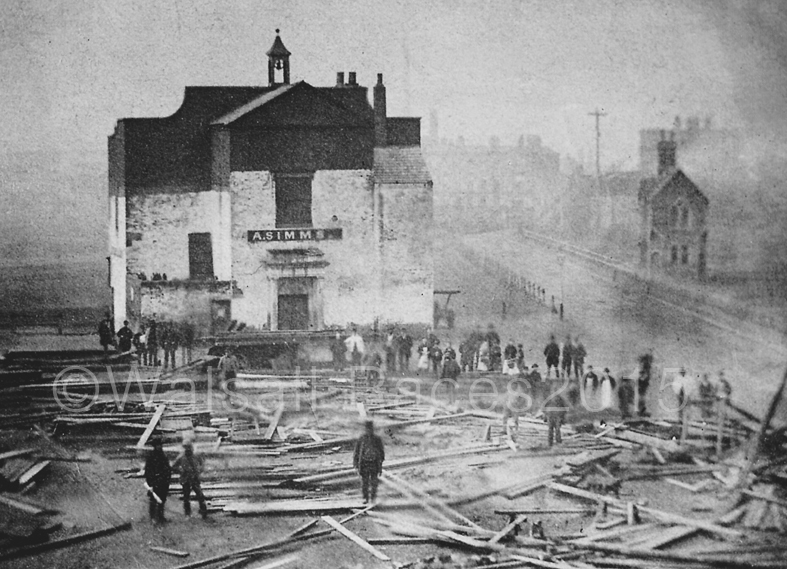 Dated from around 1876 it shows the grandstand surrounded by the remains of what is thought to be Ginnett’s Circus, it was also occupied by Alfred Simms who bottled aerated water from the premises. On the right of the photograph, to the left of the small house can just be seen Stemmer Steps, the only way to cross the railway line in those days. It was from these steps that Billy Meikle, the famous Walsall historian, and his school pals watch the proceedings on the Long Meadow. To try to show this long gone landmark of the old town in more detail I have included a cropped picture of the area with the contrast altered to make it more visible. 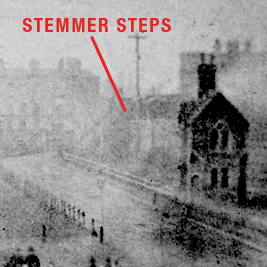 The footbridge, known as Stemmer Steps that allowed people to cross the railway lines safely. In later years the subway was built-in Bridgeman Street that allowed both traffic and pedestrians to cross under the rail lines…….providing it hadn’t flooded of course! The advertisement for the meeting in August 1943 which appeared in the Lichfield Mercury. 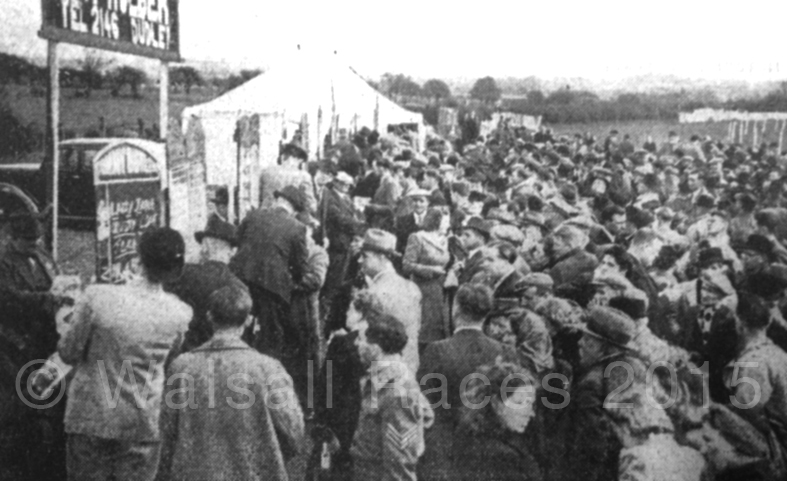 A good crowd watching the Walsall Stakes as the runners approach the winning post on Easter Monday 1946. The crowds around the boomakers stands on Easter Monday 1946. If you missed it first time around and would like a copy of this latest edition please contact me through this blog, the cost is £10 for the book and £2 P&P (in the UK) although I am willing to deliver to anyone in the Walsall and Cannock surrounding areas. The book is A4 (210mm x 297mm), contains 160 pages with black and white photographs and illustrations plus three colour pages showing some of the owner’s colours that were seen on the racecourse. 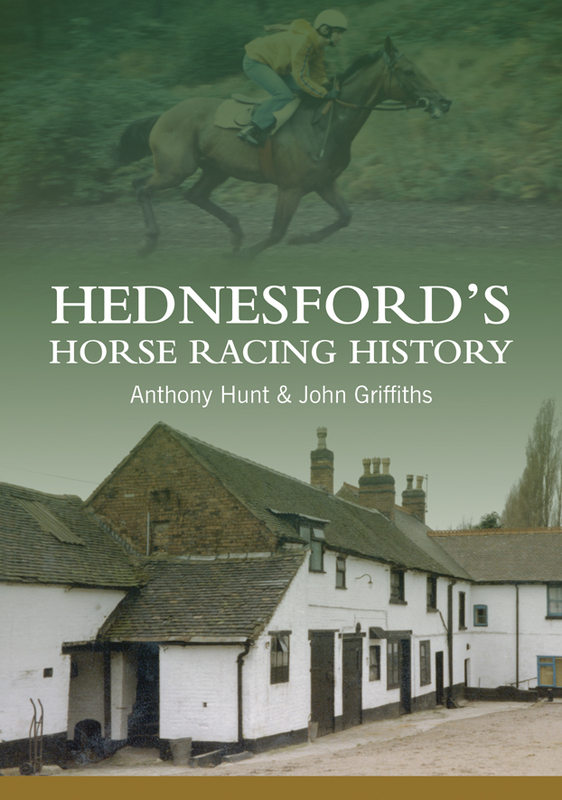 Also available is the book, Hednesford’s Horse Racing History by Anthony Hunt and John Griffiths, again this can be obtained by contacting me through this blog. The cost is £11.99 plus £2 P&P. 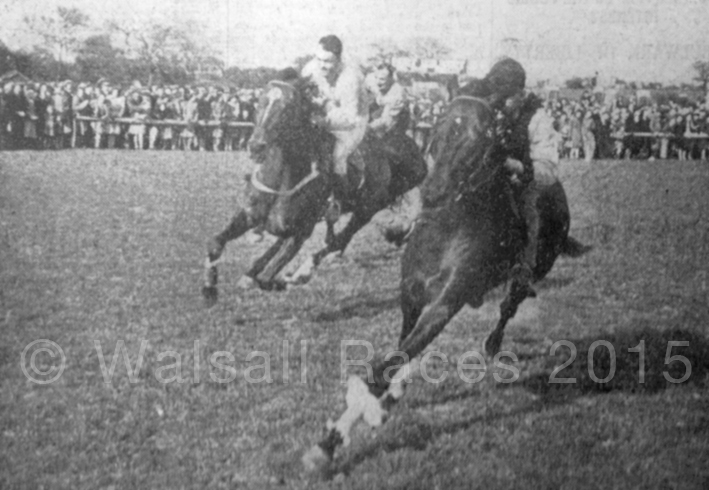 During my research for both books I met up with jockey historian Chas Hammond of New Oscott, Birmingham. What Chas doesn’t know about jockeys past and present isn’t worth knowing! After spending a near lifetime accumulating information about jockeys, Chas asked me if I would help him to put them into book format. I was only too happy to and the covers of these books are shown below along with a sample spread from one of them. The size of the four books below is A4 210mm x 297mm. « JOB TOON – Brush maker, jockey, horse trainer and publican! You are currently reading Walsall Races book re-published in 2015 at Walsall Life.